Physiotherapist Mulugeta Bayisa’s experience with Research4Life’s HINARI programme has helped him find better ways to treat his patients and teach his students. More than that, though, it has changed the way he thinks. 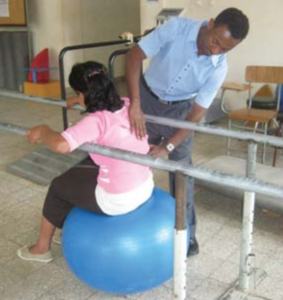 Mulugeta Bayisa is a practising physiotherapist who teaches undergraduate physiotherapy students at the University of Gondar in Ethiopia. He is also studying postgraduate clinical physiotherapy. When he first came to the university as an undergraduate student in 2005, there were few physiotherapy books in the library, and those that were available were over a decade old. Publications describing new research in this fast-changing and rapidly growing field were virtually non-existent. This became an even greater problem in 2008, when Mr Bayisa started teaching. With limited internet access and the scarcity of current print journals, the college lacked a culture of evidence-based practice. In such an environment, it was very difficult to answer the sort of questions – the why, what, who and how of clinical practice – that good teaching demands. And not only did Mr Bayisa and the other physiotherapy staff rely on old publications, but they also took an outdated approach to patient care. Treating a patient with a spinal cord injury. Research4Life’s HINARI programme has led to better results for patients and students, as well as Mr Bayisa himself. All this would change, however, in September 2010. That month, three information experts visited to talk to postgraduate students about evidence-based practice and accessing health information through the Leicester– Gondar Medical and University Link, which supports Photos courtesy of Mulugeta Bayisa 3 undergraduate and postgraduate teaching programs. Crucially, they introduced Mr Bayisa to HINARI. This, he says, marked a great turning point in his life. Using HINARI, Mr Bayisa was able to access original research articles, information on clinical trials, and reviews. Before HINARI, Google was his main source of medical information. But, without access to full journal papers, the information was often vague or incomplete, if it was available at all. As Mr Bayisa used HINARI to explore current, world-leading research, his way of thinking shifted. He describes his intellectual transformation from somebody with a passive mind who accepted what was written in books or stated by superiors, to an active thinker who questioned conventional wisdom and sought evidence for or against what he was told. Mulugeta Bayisa and his team at the University of Gondar, College of Medicine and Health Sciences, Gondar, Ethiopia. Using HINARI, Mr Bayisa worked with volunteer Joanna Griffin to develop a therapeutic exercise programme for adults living with HIV and AIDS, which is now helping such people improve their quality of life. He also used HINARI to compile evidence on the use of spinal manipulative therapy for acute lower back pain, and physiotherapy management guidelines for children with paralysed arms as a result of birth injury. He is currently developing guidelines for stroke patients. The university’s physiotherapy department is now building a research and teaching culture that is founded on rigorous appraisal of up-to-date research. Mr Bayisa and his colleagues are developing treatment protocols and guidelines that are making a real difference to their patients’ quality of life. They are now able to find answers to their – and their students’ – questions. He says that equipping students with the department’s new concept of patient care will improve the quality of physiotherapy nationwide as new graduates leave the university and begin jobs at hospitals across Ethiopia. When he sees patients these days, those “what and who” questions that previously evaded Mr Bayisa now come to mind as a matter of routine. Who are my patients? What type of treatment am I considering for them? What are the effects of my intervention, compared with those of another? Where can I find articles that will either agree or disagree with my hypothesis of patient assessment and treatment? What are the goals of my therapy? How can I prove my intervention has improved life for my patient? What evidence is available on HINARI? Mr Basiya sees HINARI continuing to play a central role in his work as a professional lifeline and a gateway to the best, most current research and clinical practice. Research4Life has also allowed him to set the baseline for his future research, which will investigate the culture of evidence-based practice among health professionals in Ethiopia. As he and researchers like him advance their careers with the help of HINARI and the other Research4Life programmes, the gap in patient care between the developed and developing countries will continue to narrow. This story is part of “Making a difference: Stories from the field” an illuminating series of case studies providing insights into how access to peer-reviewed research from Research4Life is benefiting the health, well-being, and economic and social development of communities in the developing world.